Results: A novel system that enhances the detection of hard-to-find proteins in human plasma is the result of collaboration between a national laboratory and a biotech firm. Finding these low-abundance proteins is key to finding biomarkers—changes that convey information about disease state, susceptibility or exposure—applicable to different diseases. A major challenge in protein target discovery and validation is how to dissect complex protein mixtures to identify and measure targets of interest. Scientists at Pacific Northwest National Laboratory and GenWay Biotech, Inc., have developed a new protein separation system called the tandem IgY12-SuperMix system. This system separates ~60 abundant proteins from low-abundance proteins in plasma, which allows significant enrichment of the low-abundance plasma proteins. The system was designed to be applied in tandem with the GenWay's IgY12 system for capturing ~50 moderately abundant proteins in addition to the 12 most abundant proteins in plasma. IgY stands for immunoglobulin yolk, an antibody found in chicken eggs (see sidebar). In results recently published in Molecular & Cellular Proteomics, the researchers observed high reproducibility of the tandem separations for quantitative proteomic applications. The tandem separation system showed a nearly 60-80% increase in proteome coverage from the enhanced detection of low-abundance proteins. Many low-abundance proteins with their concentrations at the level expected for disease biomarkers ( 100 pg/ml to 100 ng/ml) were detected by using this new technology in conjunction with the proteomics technologies developed at PNNL. This shows the tandem IgY12-SuperMix immunoaffinity separation strategy developed by GenWay Biotech and PNNL. The SuperMix column was generated by using the protein mixture from IgY12-depleted human plasma as mixed antigens. For the tandem separations, the IgY12 LC-10 column initially separates plasma or other biofluid samples. The flow-through from the IgY12 column is further separated by the SuperMix LC2 column into the flowthrough and eluted fractions. The typical recoveries are indicated assuming ~250 µl of plasma is loaded. Why does it matter? There is tremendous interest in using advanced proteomics technologies to analyze human plasma and serum to discover and verify candidate protein biomarkers. The difficulty is that current technologies can't detect highly relevant proteins that are of low abundance within a wide dynamic range of other proteins. The level of detection needed is in the low nanogram-per-milliliter to sub-nanogram-per-milliliter range in the presence of other proteins that are more than 8 orders of magnitude higher in abundance. "It's sort of like comparing the size of a little bug with the size of the state of Washington," according to PNNL senior scientist Wei-Jun Qian. One way to detect these low-abundance proteins is to remove those more abundant proteins that may be masking them. For example, in the human plasma proteome, 22 proteins are responsible for 99 percent of the total protein content. This leaves perhaps hundreds of thousands of other proteins in only 1 percent of the protein mass. Effective strategies for removing these 22 proteins (and possibly the medium-abundance proteins) can greatly enhance detection of low-abundance proteins within this important biofluid. So how do they remove these masking proteins? Increasingly, scientists are using purified antibodies as immunoaffinity reagents to specifically remove abundant proteins. They can even target a number of proteins for simultaneous and efficient capture. Methods: The concept behind the SuperMix immunoaffinity separation is that antibodies can be generated against mixed antigens such as the proteins present in human plasma. Because the antibody titers—or concentrations—correspond to the abundance and the immunogenicity of the proteins, the assumption is that moderately abundant proteins in human plasma may lead to much higher immune response than lower abundance proteins. As a result, a purified mixture of these antibodies can be used to capture a large number of medium-abundance proteins especially when applied in tandem with a high-abundance protein removal strategy such as IgY12. 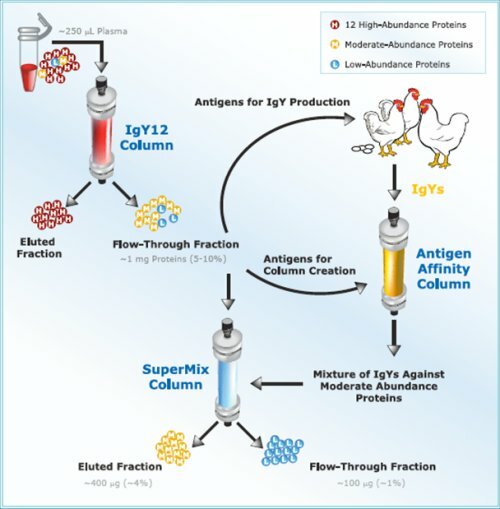 Because the SuperMix separations column contains antibodies against those medium abundance proteins from the IgY12-depleted plasma sample, it can be applied along with the IgY12 column as a dual separation strategy to significantly enrich low abundance proteins by capturing a relatively large number (>50) of high or medium abundance proteins onto the IgY12 and SuperMix columns. 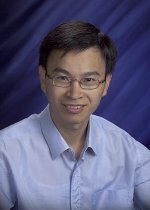 Acknowledgments: The team includes Wei-Jun Qian, David Kaleta, Brianne Petritis, Hongliang Jiang, Tao Liu, Xu Zhang, Heather Mottaz, Susan Varnum, David Camp II and Richard Smith, PNNL; Lei Huang, GenWay Biotech, Inc.; and Xiangming Fang and Wei-Wei Zhang, Acrotics Corp. This work was supported by the National Institutes of Health's National Center for Research Resources, the National Institute of General Medical Sciences, the Entertainment Industry Foundation (EIF) and the EIF Women's Cancer Research Fund. The experimental work was performed in the Environmental Molecular Sciences Laboratory, a U.S. Department of Energy national scientific user facility at PNNL. Reference: Qian W, DT Kaleta, BO Petritis, H Jiang, T Liu, X Zhang, HM Mottaz, SM Varnum, DG Camp II, L Huang, X Fang, W Zhang, and RD Smith. 2008. "Enhanced detection of low-abundant human plasma proteins using a tandem IgY12-SuperMix immunoaffinity separation strategy." Molecular & Cellular Proteomics. MCP 7(10):1963-1973. Purified antibodies are used most commonly in research to identify and locate proteins in cells. These antibodies are usually produced by injecting a mammal (rabbit, mouse or rat) with a substance called antigen, which stimulates antibody production in the blood serum. However, some companies obtain immunoglobin yolk, or IgY, antibodies from chicken eggs rather than from mammals. IgY antibodies are more distantly related to those of humans, making it easier to raise a wide spectrum of antibodies against proteins. And because the antibodies come from chicken eggs, no blood is involved in producing them. This makes them easier to extract, saving time and money, and they are less subject to contamination than those in mammalian serum.